2 tablespoons Cream o’ Naise plus extra for frying. Thinly slice porcini mushrooms before adding to pan with garlic and cooking until soft. Mix shredded chicken with 2 or more Tablespoons Cream o’ Naise. Slice four thick slices of fresh seeded bread. 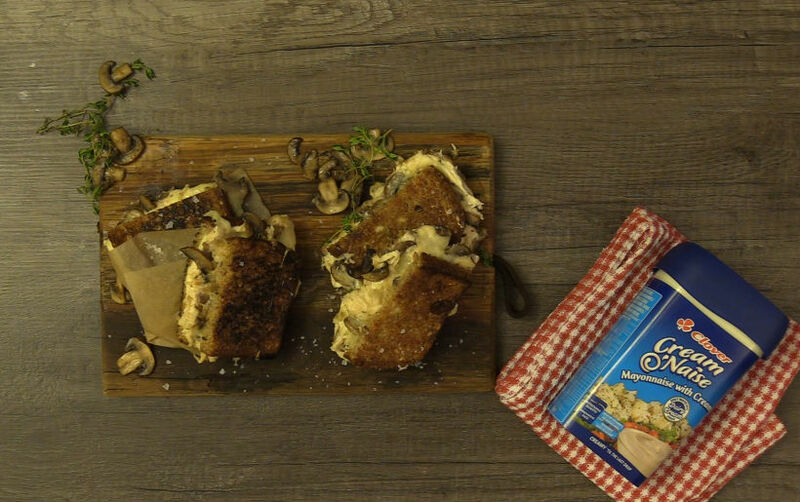 Place 2 pieces of bred on flat surface and layer with a slice of gruyere, cooked mushroom, shredded chicken, slice of mozzarella and top with other piece of bread. Pre-heat pan on low heat. Coat the outside of the sandwich with a layer Cream o’ Naise and place in pan. Allow one side of sandwich to brown and filling to melt slightly before flipping and browning the other side, allowing cheese filling to melt completely.